Anabolic Xtreme StimulantX What Are You Waiting For! Dietary supplement. Xtreme energy & fat loss technology. No. 1 selling 8 hour formula. StimulantX is serious weight loss, energy, and appetite control - we're talking about rapid, significant weight loss and extreme loss and extreme energy, finally together in one power-packed pill. What will StimulantX do for you? Plenty, let's take a look. Increased energy. StimulantX delivers clean, jitter-free energy. So whether you're working out or working round-the-clock, StimulantX gives you the energy you need to be at the top of your game. » Increased stamina. Some so-called energy boosters pick you up higher than a kite, only to let you crash off a cliff in just a few hours when they wear off. Harsh! 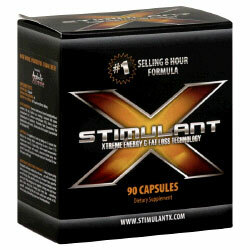 StimulantX, however, provides up to 8 hours of clean non-stop energy, without the jitters or the crash. » Increased calorie expenditure. If you think having all that energy must be doing something to your body, you're right - StimulantX is sharply accelerating the rate at which you burn off calories. » Suppressed appetite. Along with vaporizing those calories, guess what? StimulantX is also obliterating your appetite, so you eat less (and whatever you do eat gets burned off instantly anyway). » Decreased weight. As you've already figured out yourself, less eating + faster metabolism = reduced weight (and a load off your mind). And speaking of your mind. » Improved mood and outlook. StimulantX isn't just about your body. It's also for your mind. Those who use it, invariably report a profound sense of well-being, an all-day good feeling. » Improved mental focus. In today's multi-tasking, distraction-per-second world, everybody needs help staying focused. StimulantX gives your brain the ability to zero in on what's important and stick with a project till it's done. StimulantX works like no other product you have tried. Provides all day energy and fat loss, promotes a positive sense of well being and unmatched mood enhancement. A powerful appetite suppressant, you need to remind yourself to eat. Good clean energy without the typical jitters and shakes. What should I expect form StimulantX? A diet program using StimulantX will begin working from day one - you will immediately feel an increase in your energy levels and a decrease in your appetite on the first day. » High energy plus low appetite. Getting more and more done, while eating less. Feeling great every day - unleashing yourself - and feeling like you've got a whole new outlook on life. Ingredients: Active Ingredients: Guarana Seed Extract (Mixed Methylxanthines Including 100 mg Caffeine per Serving), Geranium Oil Isolate (Standardized for 2-Amino-4-Methylhexane HCI), Barley Extract (Standardized for Hordinine), Periwinkle Plant (Standardized for Apovincamine Ethyl Ester), Pausinystalia Bark Extract (Standardized for Aphrodine HCI). As a supplement, begin by taking one (1) capsule first thing in the morning before progressing to one to three (1-3) capsules one or two (1-2) times daily. Never exceed recommended supplemental dosages and consult a physician before using this product. Those with sensitive stomachs may find it beneficial to take this product with food.